A local tourism expert is concerned about what she perceives as the absence of a clear policy and direction for tourism development following the opening of the Argyle International Airport. Vera-Ann Brereton, tourism consultant and a former director of tourism in St Vincent and the Grenadines was the guest speaker last week at the Frenches House during the opening ceremony of the sixth International Garifuna Conference. 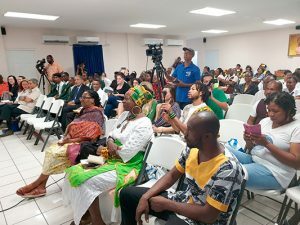 A section of the audience at the opening ceremony of the sixth International Garifuna Conference held at Frenches House last week. Brereton said that over the years, tourism has moved from being a product of the exploratory nature of man, to one of exclusivity, to an industry where travel is no longer the exclusive domain of the wealthy. “The tourism product has moved from being perceived as simply comprising a physical structure, for example, the tourist accommodation, to one in which the average visitor is no longer content to spend his or her entire vacation relaxing on a beach or beside a swimming pool, but instead seeks a more active lifestyle, and has a strong desire to learn about the culture and heritage of his or her chosen vacation destination,” Brereton explained. She noted that here, some of these have been identified by the authorities as target markets but other niche markets can include bird watching, culinary/gastronomic tourism, cultural, heritage tourism, cycling, diving, festivals, health, wellness and spa tourism, homestays, meetings and conferences, sailing/yachting, soft adventure, sport tourism, and weddings and honeymoons. Brereton said that locally, international stayover visitor arrivals in 2018 was excellent but she has a feeling of concern for SVG. “Why a feeling of concern you may ask? That is because I am not convinced that this country has a clear policy and direction on where, how, by whom, and how much, (including economic, social and environmental parameters) for tourism development following the completion and operationalization of the Argyle International Airport. It almost seemed that in the initial stages of airport development there was a feeling of ‘have airport, tourists will come’,” Brereton stated. She said when we look at heritage tourism generally and specifically for SVG, we will recognize the critical importance of this type of tourism. “The management of tourism affects the conditions of destinations and host communities, and more broadly, the future of ecosystems, regions and nations. Informed decisions at all levels are needed so that heritage tourism can make a positive contribution to tourism development generally,” Brereton said. She noted that informed decisions are based on sound data and research and in this area, she commends the Garifuna Heritage Foundation for its focus on research and knowledge development of our Garifuna Heritage. “However, it would appear that not enough attention is being given to research, for example by the authorities, and this may very well be a result of limited financial allocations. This needs to be addressed,” Brereton told listeners. But Brereton says that before even embarking on the development of a heritage tourism attraction, a number of critical areas must be considered in order to determine the tourism potential of the site/attraction, including the potential benefits to the host community. She added that some of the work being undertaken by the Garifuna Heritage Foundation sees areas of heritage being explored and brought to the fore such as food, dance, art and craft, language, and sacred places, in particular, the island of Balliceaux. “I was disappointed, though not surprised, to hear that some of the plans for 2019 have had to be shelved due to poor public support. Unfortunately, this is one area that every individual, every organization, every group in SVG has to grapple with, that is a high degree of apathy and low community enthusiasm. “And this is why it is so critical that, as a matter of urgency, the authorities undertake the development of a Tourism Policy using a ‘Bottom-up Approach’. “More than any other type of tourism, perhaps, Heritage Tourism must be carefully planned and developed in order to ensure some degree of success. There must therefore be clear parameters provided to communities when encouraging them to come on board,” Brereton commented. 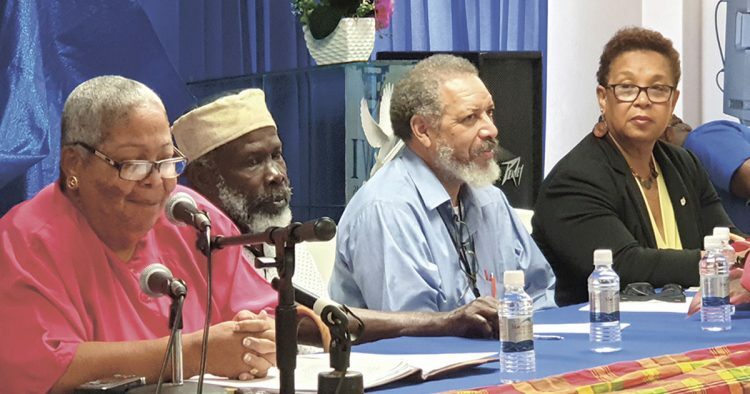 She stated that on the issue of sacred sites, she believes that the island of Balliceaux, which is privately owned, should become a protected heritage site. “I know that the island is considered to be a sacred site by the Garifuna people. However, I would like to recommend that Balliceaux be officially declared a Heritage Protected Area and carefully developed and managed under very strict guidelines, and of course, with the full involvement of the Garifuna People. Thereafter, limited and select tours could be offered,” Brereton suggested.